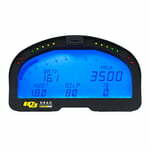 Racepak IQ3D digital dash instruments offer a compact, all-in-one solution for data acquisition. Adding a robust, built-in data logger to the popular IQ3, the drag race versions display information on four user-definable pages—and recorded data is stored on a microSD memory card located on the face of the dash for easy access. You can record engine rpm, driveshaft rpm, oil pressure, water temperature, and battery voltage. Smarter racing; get onboard performance that could change the way you compete ... and win, with Racepak IQ3D. The IQ3D connects to the above ECU systems using EFI adapter cables. Records Engine and Driveshaft RPM, Oil PSI, Water Temperature, Battery Voltage and 12v Event. Displays up to 28 inputs via 4 pages. User defined 5 character sensor input names. Programmable shift light output for up to six shift points. Shielded, low luster display for sunlight viewing. Connects to over 20 aftermarket EFI products including Holley, FAST, Big Stuff 3 and more. Racepak LLC warrants all merchandise manufactured by Racepak LLC against defects in workmanship or material for a period of six (6) months after the date of purchase. This warranty applies to the first retail purchaser and covers only those products exposed to normal use or service.